President Donald Trump has long pointed to his daughter and adviser Ivanka Trump as his conscience, always steering him in the direction of better judgment. But as her father’s presidency continues to careen on, she appears to be having little influence. Reports say she was not able to steer him away from disaster yet again, as the president announced yesterday that the United States would pull out of the Paris Accord. Ivanka was reportedly in favor of staying in the agreement, created to protect the environment and joined by nearly every country in the world. “With Ivanka, we thought at least we’ll always have Paris. But that turned out to be fiction, too,” Democratic strategist Rebecca Katz told Politico. Trump also broke with the tradition of issuing a Pride Month proclamation, set by former president Bill Clinton and revived by former president Barack Obama. While “Great Outdoors Month” made the grade, there was no such attention paid to the LGBTQ community Trump claimed to be an ally to during the campaign. Ivanka tweeted out her support of Pride Month, which went over about as well as you might expect. Who is this "we" you talk about? Because your father isn't celebrating us – that's for damn sure!! 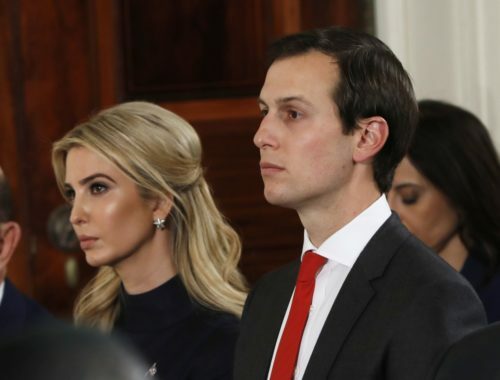 Kushner and Ivanka were widely praised for helping stop the anti-LGBTQ religious freedom executive order that was expected to be signed by the president, a leaked draft of which showed the civil rights of the community would be seriously under attack. What resulted was a much weaker, though still problematic, executive order going after the Johnson Amendment, which limits nonprofits, including churches, from endorsing a candidate or political party. While we don’t know what went on behind closed doors, it seems that may well be their one big accomplishment in pulling him to the left. Yet outside of that, it appears more and more that the less moderate wing is winning out in the White House. Those words are as true now as ever, if not more so in light of this week. Meanwhile, Kushner sits at the center of an investigation into ties between the Trump administration and Russia. There may be a way out of all this mess, but surprise, surprise, it’s not through his daughter, nor through his son-in-law.